Thanks to everyone who commented for a chance to win the Gun Digest 1944-2013 3-Disc Set. It has been great to hear from long-time followers of Gun Digest, others like us who enjoy reading everything we can about guns. And, a hearty welcome to the many newer readers. We’re glad you found us, and we hope you like what you find here. Congratulations goes out to “Clermont,” the winner of the Gun Digest 1944-2013 3-Disc Set. 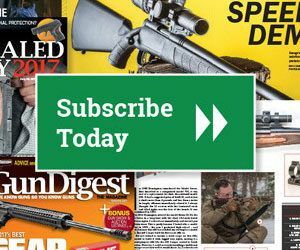 If you didn’t win the giveaway but can’t resist the idea of having every edition of Gun Digest ever published, stop by the Gun Digest Store to get yours today. ***This just in from the GD Store: Use Discount Code AMMO1 to receive free U.S. shipping and an extra 10% off an order of $30 or more (Offer valid thru 10/26/12). Thanks for reading the blog, and remember to check in often for more chances to win great Gun Digest books. Corrina Peterson manages book acquisitions and production at Gun Digest Books, the leading publisher of books covering everything there is to know about guns, ammo and knives. Corrina's interest in firearms began as the result of a close relationship with an M16 during active duty military service and went on to include trap shooting, upland bird hunting and wilderness elk hunting.